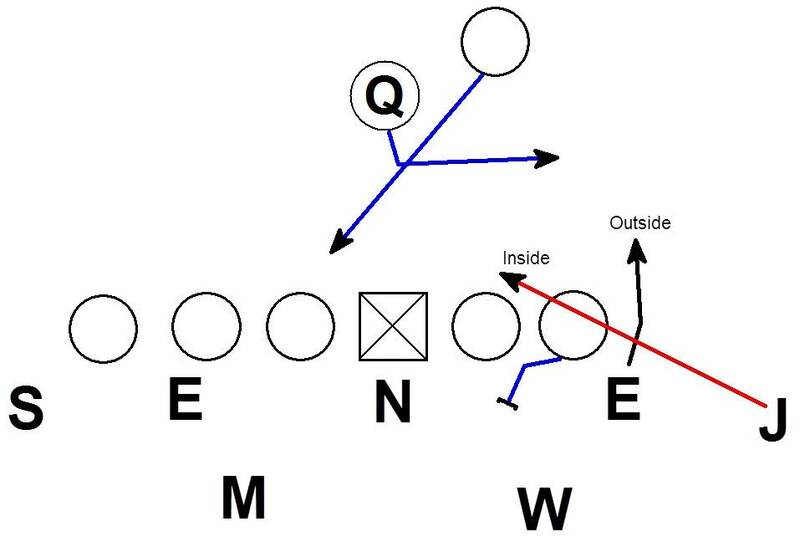 Regardless of a defensive scheme the situation may occur where the defense wants rush a player aligned outside the box into an inside gap. 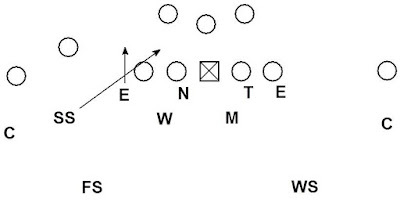 Here is an example of when the technique might be used in a 3-4 defensive structure. The Jack outside linebacker is blitzing from an outside alignment into the B gap. 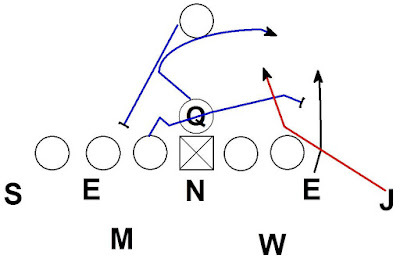 The same technique can apply to an overhang player in a 3-3-5. 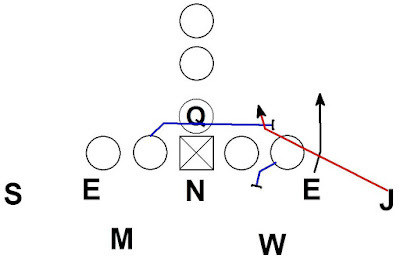 Or a SS/Nickel pressure in a 4-2-5. 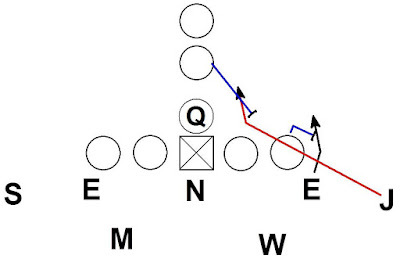 Here is one approach for teaching the outside to inside blitz technique. 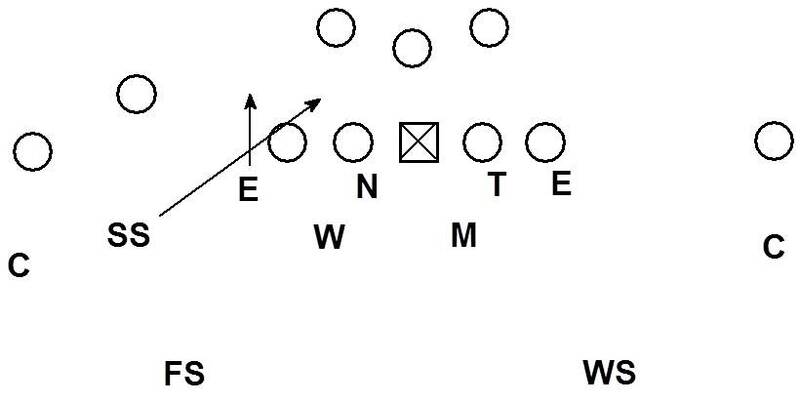 The defensive end takes a wide alignment to get up the field and outside. 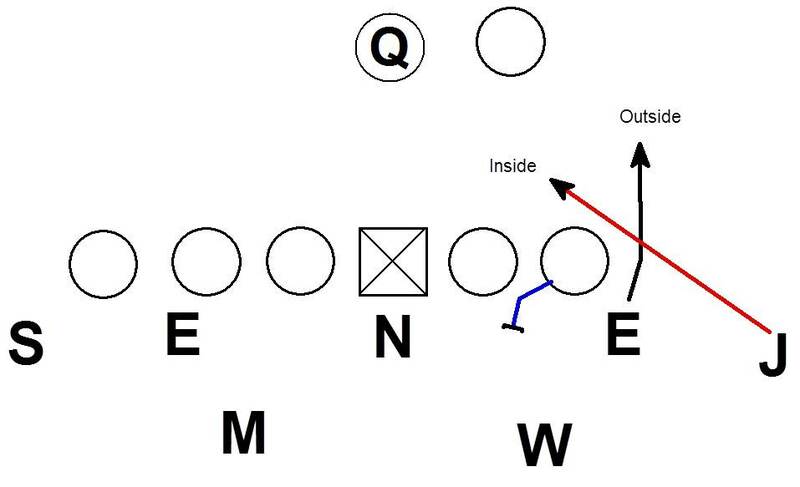 The blitzer is on a 45 degree track on a path to replace the DE's heels as the DE launches up field. 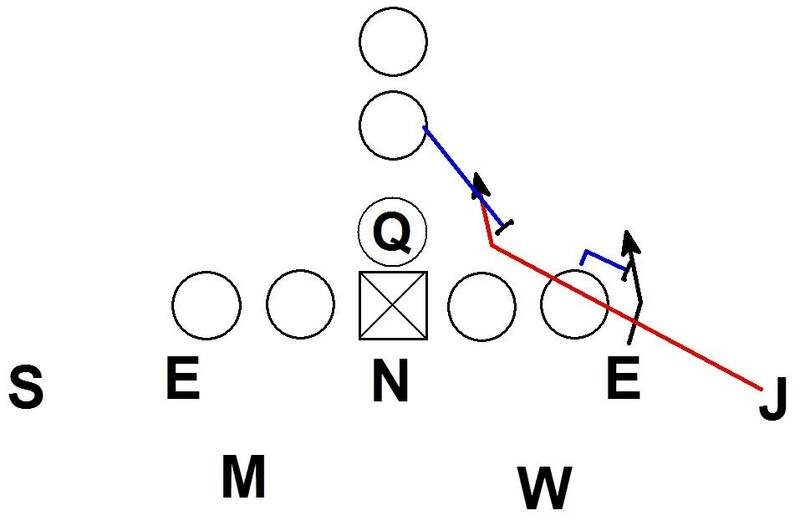 The blitzer is reacting to the block of the OT. If the OT blocks out to the DE, the blitzer stays on his track to control the B gap. 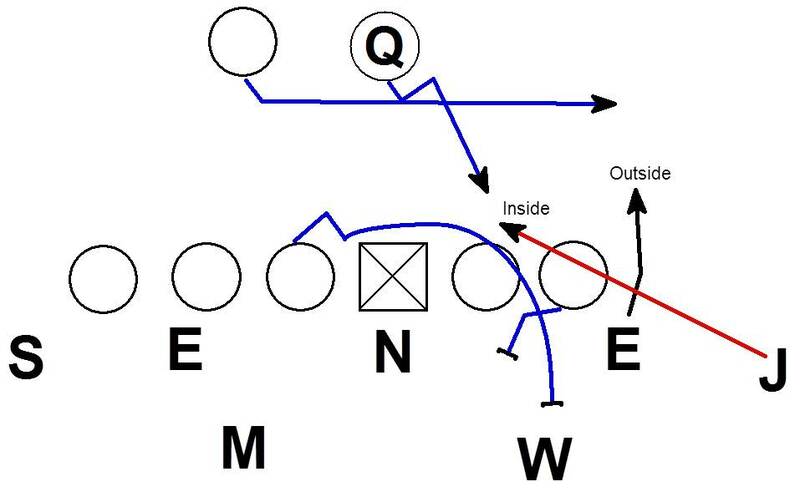 If the guard is zone blocking into the B gap, the blitzer must be ready to react and maintain B gap leverage. If a FB is lead blocking in the B gap the blitzer will spill the block (NEVER KICKED). Spill = hit the blocker thick on the inside half and pry up the field. 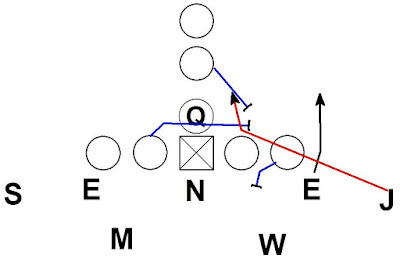 If there is a puller on the blitzer's track into the B gap, the blitzer will spill the puller (NEVER KICKED). If the OT blocks down, the blitzer will stay on his 45 degree track and control the B gap from behind the line of scrimmage. If the OT is blocking down and there is a puller, the blitzer will spill the puller (NEVER KICKED). 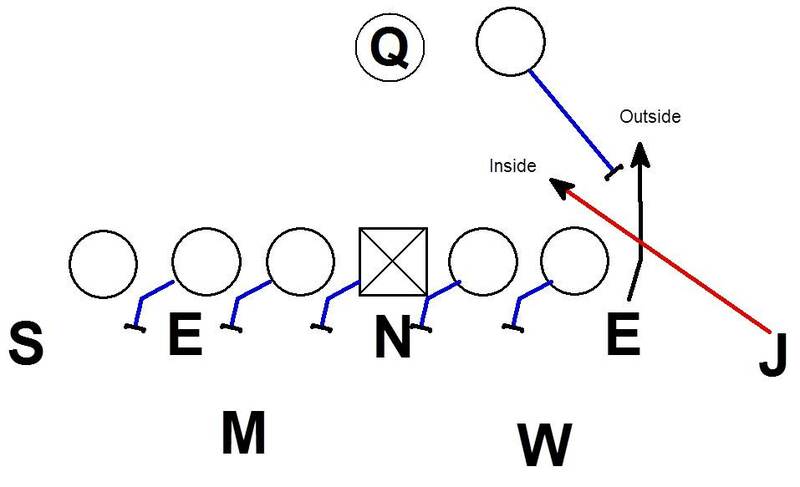 If the OT is blocking down and there is a FB lead block, the blitzer will spill the lead (NEVER KICKED). 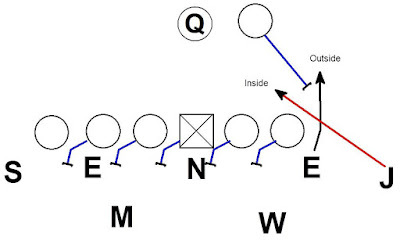 If the OT is blocking down and there is a puller and lead block, the blitz will spill the puller. The goal is to get a 2 for 1. 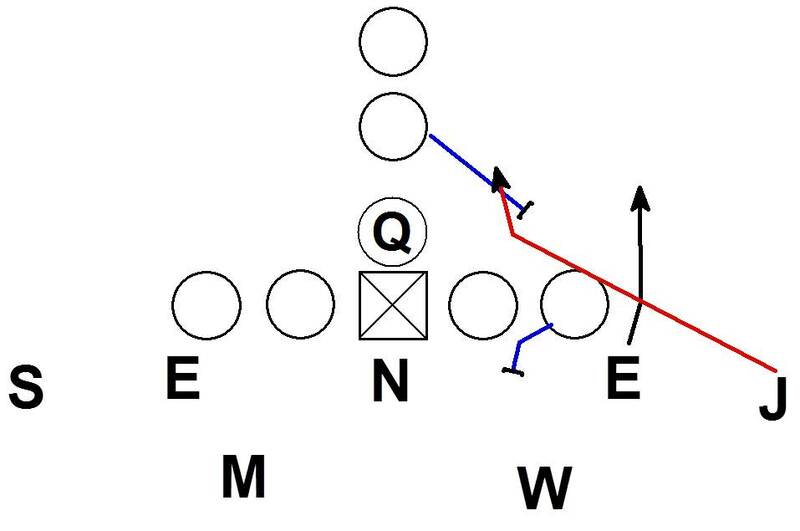 Against a down block by the OT, the End will handle the outside threat while the blitzer will handle the inside threat. 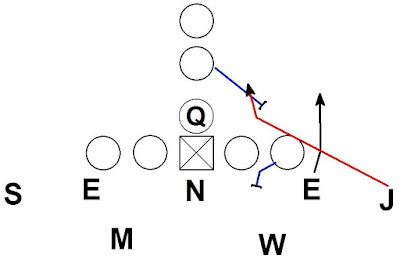 Against veer option, the inside threat is the dive. The blitzer will stay on his track and tackle the dive. 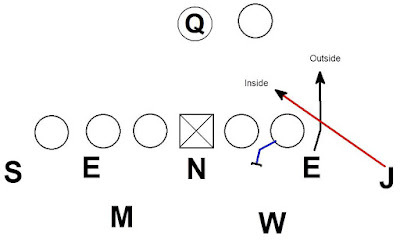 The End will take the outside threat and handle the QB. 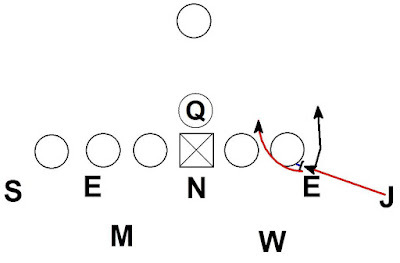 Against zone read, the RB is the inside threat. 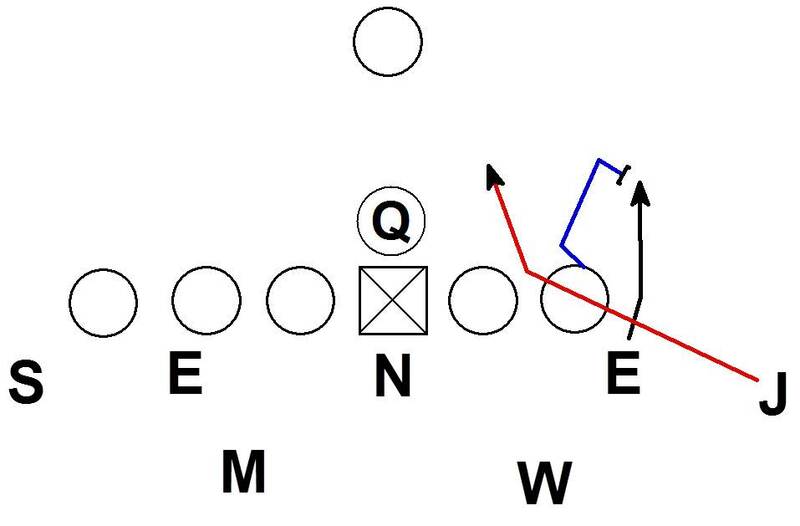 The blitzer will flatten and chase behind the LOS tackling the RB. The End is playing for the outside threat and will tackle the QB. 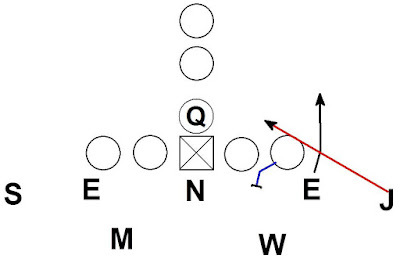 Against read power, the inside threat is the QB. The blitzer will tackle the QB. 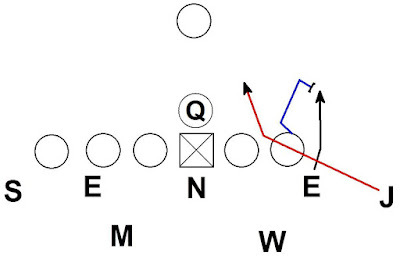 The blitzer must be ready to spill the pulling guard (NEVER KICKED). 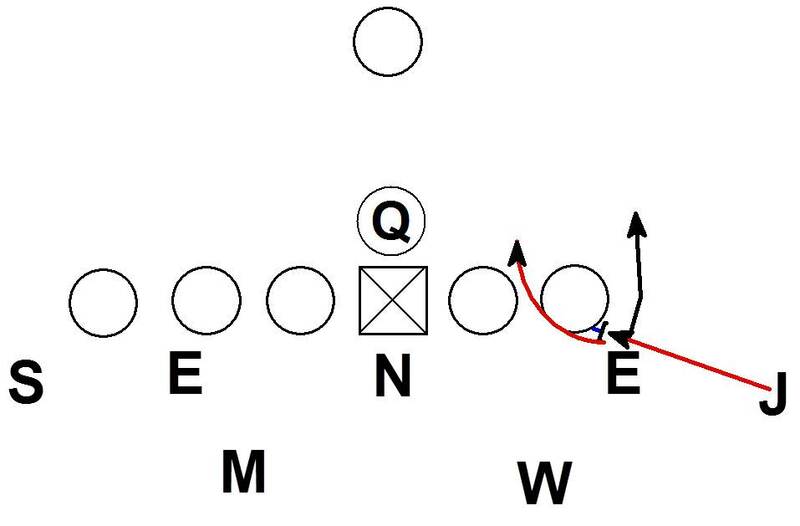 The End will play the outside threat in this case the sweeping RB. 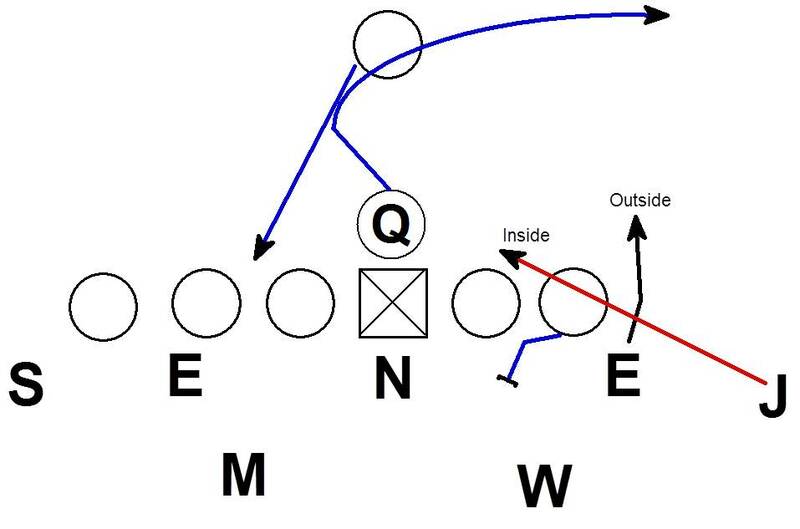 Against any naked scheme the blitzer can chase the run because the End is outside for contain against the naked. The blitzer must be ready for a puller on boot. 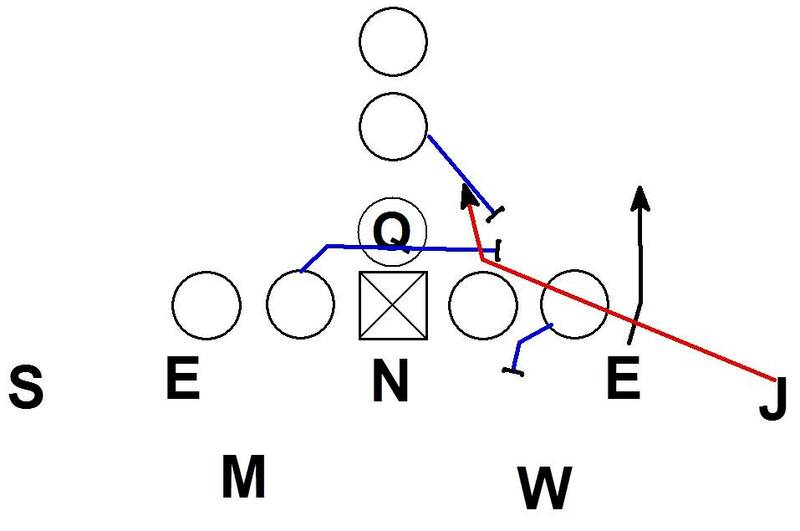 The blitzer will spill the puller (NEVER KICKED) and pry up field. 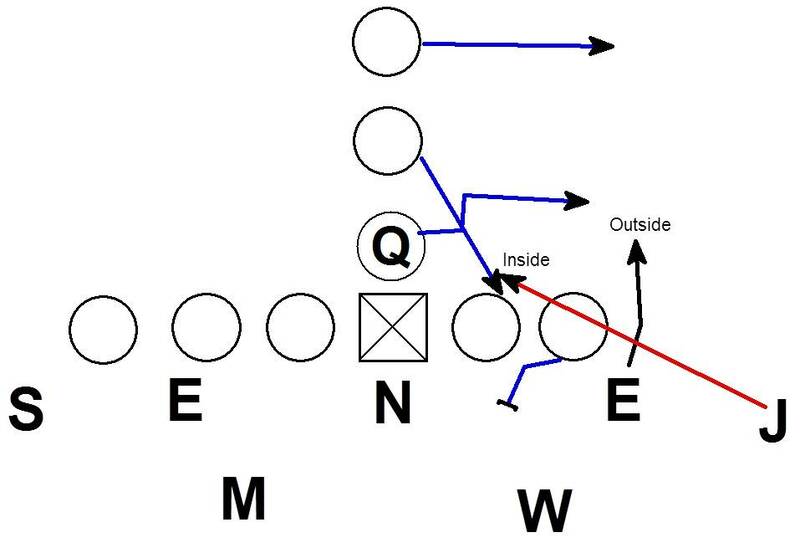 If the QB continues outside, the DE will apply pressure and contain. 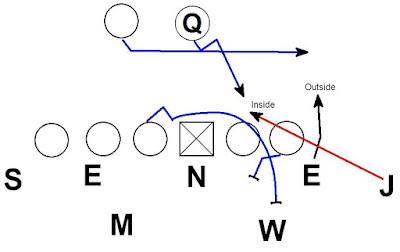 If the QB attempts to pull up inside the guard's pull, the blitzer will apply pressure. If the OT tries to block the blitzer, the blitzer must control the B gap. 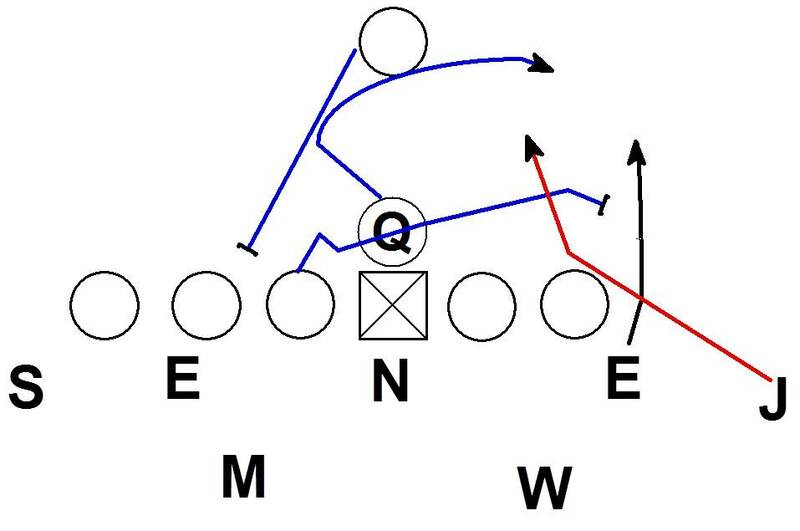 The blitzer should have his hands ready to shock the OT and play into the B gap. If the OT pass sets, the blitzer will pass rush through the B gap. 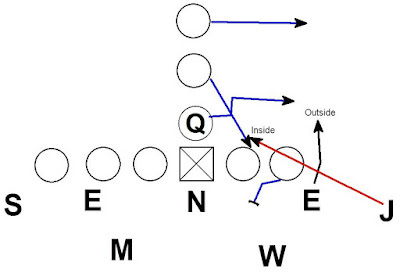 The DE is up the field outside for contain. 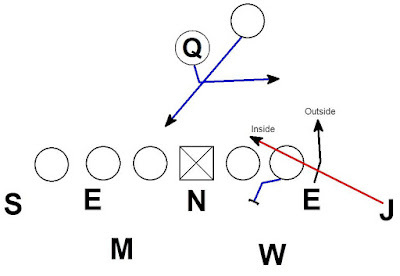 The DE CANNOT use a counter move to the inside. Here is a good example of a Nickel blitzing using this outside in technique. Against a full slide protection the blitzer and DE will bracket the RB. 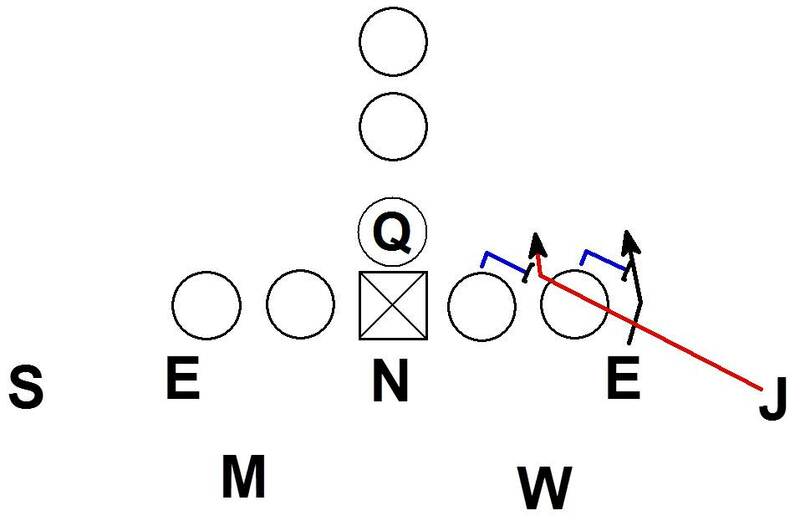 The blitzer is inside the RB's block and DE is outside for contain. This outside to inside blitz technique can be a nice compliment to traditional edge pressures.